Rabbi Nosson and Chaya Potash moved to Cole Valley in 2011 to meet Jewish needs and interests in the Cole Valley, Inner Sunset, Twin Peaks areas and beyond. Drawn to the friendly and open minded community, they decided to make a life­long commitment to make Cole Valley their home. “People talk to each other on the streets; it feels like a village in the city”, says Rabbi Nosson. With a significant Jewish population in the area, but no established Jewish presence within three miles, the Potashs are filling an important role to enhance Jewish involvement and nurture a Jewish community in the neighborhood. “We are not looking to replace existing synagogues or other Jewish institutions, but to build Jewish community close to home by bringing neighbors and friends together through shared Jewish experiences,” says Rabbi Nosson. Rabbi Nosson and Chaya have an open­door policy, where they are meeting Jewish needs and interests at any level. Whether it is at their Shabbat table, over coffee at Café Reverie, at a visit in your home or at your hospital bed, at a community volunteer day, or at the playground, Rabbi Nosson and Chaya are meeting people where they are at in life in a relaxed, personal and pressure ­free way. 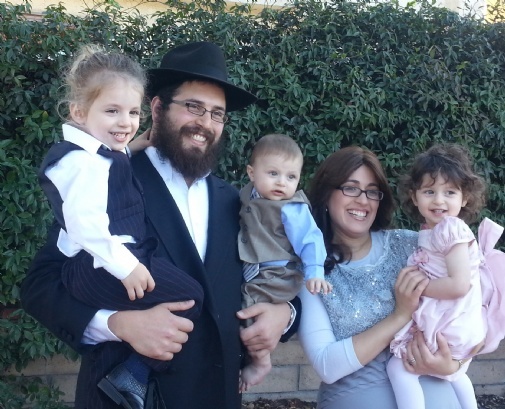 Rabbi Nosson and Chaya are the proud parents of Mendel, Baila and Avraham.